Teton Family has a clear mission: to support your over-flowing cup called “life.” And we’re lucky! Because having you as our audience pushes us—in typical mountain style—to deliver content that supports the true meaning of our tagline (“Live fully.”). 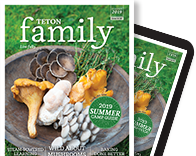 With up-close profiles of artisans who make jobs out of a passion, cutting-edge ways to deal with modern health issues, and farm-fresh recipes you’ll dog ear and return to for seasons to come, we’ve got the local culture on lockdown. And our “Ultimate Summer Camp Guide” offers busy parents a fingertip go-to for unforgettable childhood memories. Everyone’s family when you live in the mountains; and we’re here to deliver the commentary. kal@tetonmediaworks.com or (307) ­699-­3620, for rates and specifications.